If you open a pizza joint and decide to skimp on the cheese, you’re probably toast within a year. If you sell overpriced tires that don’t perform, you’ll end up with a dead-end business. If your supermarket shelves are constantly out of stock and you’re burdened by poor customer service, shopping carts will roll elsewhere. Not so in the National Football League, where success on the field is hardly the critical factor in a club’s bottom line. Whether you are holding up the Vince Lombardi Trophy or you’re in the midst of an 11-year playoff drought like the Bucs, you can’t lose money in this venture. In fact, the cash keeps rolling in before the first stadium gate is opened. NFL teams protect their tax returns like Bill Belichick protects his game plans, but once in awhile a crack appears and daylight floods in. In an illuminating report, the Kansas City Star got a peak behind the curtain through diligent reporting, reinforcing the view that money from attendance, parking and concessions is dwarfed by other revenue streams. “Team financial records rarely become public,” Stanford economics professor Roger G. Noll told the newspaper. The Star found that less than 2 percent of Kansas City’s revenues came from parking. In contrast, the Chiefs receive more than $100 million annually from their slice of the TV pie and another $100 million combined from NFL Ventures, the league’s marketing arm, and NFL Enterprises – revenues from NFL Network and NFL Sunday Ticket. Unlike baseball, where there is no salary cap and teams are free to work out their own TV deals, the NFL limits expenditures on players and shares TV money. That’s why hedge fund manager David Tepper was thrilled to fork over a league-record $2.3 billion last May to purchase the Carolina Panthers, who play in the nation’s 23rd-largest TV market. When you have guaranteed revenue streams of this magnitude flowing in every year, incentive becomes a legitimate concern. Plenty of Buc fans wonder whether the Glazers would be more committed to winning if their bottom line was directly linked to the standings. Media pundits are always seeking to pounce on a perceived trend. It has become fashionable to suggest the NFL is in financial peril, pointing to some declines in ratings and fan attendance. In 2017, 37 of the top 50 broadcasts on U.S. television were NFL games. And the rise of legal sports betting will only increase all those eyeballs. This league is already a $14 billion business and suddenly Roger Goodell’s goal of $25 billion in league revenues by 2027 doesn’t seem so outlandish. This commissioner has been very good for business — that’s why he is still the commissioner. Goodell has also been good for the Glazers, who paid a then-record $192 million for the Bucs in 1995. Forbes estimates this franchise is currently worth $2 billion, with $88 million in operating income by the end of the 2017 season. 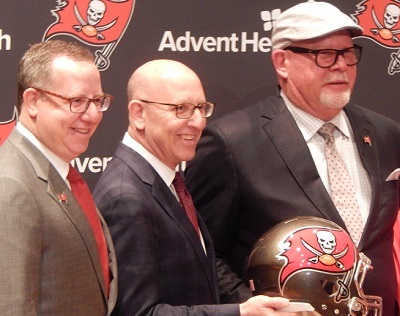 Based on their football foibles, the Bucs should be reeling financially. But that’s not the way it works in the NFL, where TV primes the pump and tepid fan interest is considered collateral damage. Agree with Noll on one hand (annual income vs expenses), but Won-Loss records over time surely affect each franchise’s value. According to Business Insider Ira, Robert Kraft bought the ‘struggling’ NE Patriots in 1994 for $175 million. Today it’s worth an estimated $3.8 billion (second only to the Dallas Cowboys). So Malcolm paid roughly the same for the Bucs at about the same time, but the Pats are now worth almost twice as much. Not bad work if you can get it. Cleveland won eight games last year. Lost two or three overtime games and a host of one-score games. Anyone have the financials on Man U?…Hand over fist, these Glazers. Defense Rules- What you say may be true, but the point is that they are still making good money for a poor product. There’s not much incentive to field a good football team if you’re still making just around a measly $100 million and have a 5-11 team. And still some of the worst gameday giveaways (IF THEY EVEN HAVE THEM!) in the league!! AND WE LOSE A HOME GAME THIS SEASON! So the stadium could be empty and they are still banking some loot! As fans, we have no effect on the bottom line. So if they want to continue to put a poor product on the field and sit back and count their money, they can! Luckily they seem to care! Luv you article here Ira. I know you could write a book on this one topic and this..is only the tip..of the iceberg. Its why I’ve said all along the Glazers should just turn everything over to football knowledgeable people…and keep counting their profits. Their gonna make millions anyways. Don’t matter. So please Glazers, do not hand us the horse spit of being concerned about attendance when you and every other owner benefits from NFL Sunday Ticket, NFL Exchange and fantasy football. The NFL in warm weather markets is an afterthought where opposing fans can vacation… piss off season ticket holders and no one cares. If Man U were on the brink of relegation and the Glazers stood to lose millions, they would look like the Patriots. Not eve a great return….. 192 million put into an S&p 500index fund would be worth over 3 billion dollars today. 192,000 now worth 2 billion is about a 10.5% annual gain. Not saying owning a team is a dream of a lifetime but the returns are nothing a mom and pop cant do. And don’t forget the dividends… 192 million in the s&p kicks off 5.5 million in cash to you.. our own a franchise that drafts a kicker, can’t put their qb on a billboard, is irrelavent to the nation and wastes countless # of fans lives. Yep…so here we are….stockholders in a Bucslife baby! Why do teams move then?